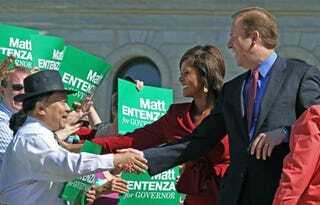 "Democratic gubernatorial candidate Matt Entenza picked Robyne Robinson, who left her anchor post at Fox 9 Wednesday, to run on his ticket," the Star Tribune of Minneapolis reported on Thursday. "The pick, announced in person on the Minnesota Capitol steps a few minutes after Entenza announced it on Twitter, ended a week's worth of speculation fueled by Robinson's confirmation that she had been asked to run with him," Rachel E. Stassen-Berger wrote.
" 'It’s my distinct pleasure to announce Robyne Robinson @robynempls as my choice for lieutenant governor! Please welcome her aboard,' Entenza's staff announced on his Twitter account." Robinson, the first African American anchor in the Minneapolis-St. Paul market, said her goodbye to viewers Wednesday night after she had already confirmed that she might be picked as a candidate, and amid criticism questioning the ethics of how she and the station handled that prospect. "On her last 5 p.m. newscast, she read a poll about the Minnesota governor's race, which included the candidate whose ticket she was about to join. The next thing on the air was an Entenza ad," the Star Tribune noted. "She and her station say there's no conflict of interest until she officially announces she's a candidate. Bull," Neal Justin had written Wednesday in his Star Tribune blog. "The minute she said openly that she'd think about it should have been the minute Fox officials thanked her for her service and showed her the door." "The mere possibility of an Entenza-Robinson ticket generated more heat for Entenza’s campaign than he’d been able to produce on his own, despite his year long campaign and his first-in-the-race television ad presence. While Fox 9 isn't seen in every corner of the state, she has fans all over and adds star power to his campaign. "If the ticket wins, Robinson would be the first African-American lieutenant governor. But she’s not the first African-American candidate for the spot. Back in 1990, Independent-Republican candidate for governor Doug Kelley picked doctor and Eden Prairie City Council member Jean Harris as his running mate." "Robinson hasn’t been directly involved in Minnesota elections — she hasn’t made any political donations, according to state and federal records. But her leanings haven’t been a mystery. More than a decade ago, she had a wall’s worth of political buttons that included, 'I believe Anita,' 'Jesse Jackson,' and 'U.S. Out of Persian Gulf.'" "Last Sunday, the legendary jazz pianist Hank Jones died peacefully at the age of 91, at a Bronx hospice," journalists who write about the New York Times anonymously for the nytpicker website noted on Sunday. "By the next day, NYT reporter Corey Kilgannon had talked his way into Jones's room in an Upper West Side apartment. On Tuesday, Kilgannon (sharing a byline with City Room editor Andy Newman) posted a piece on the City Room blog that portrayed Jones as a lonely old man in a messy studio — setting off a firestorm of complaints from Jones's family and friends that he'd invaded Jones's privacy, and besmirched his legacy. "We'd say the complainers are right on both counts. Intentionally or not, the City Room post reads like an attempt to make Jones's life look lonely and sad, made even worse by the reporter's brazen disregard for Jones's privacy by snapping — and publishing — a photo from inside his room." Kilgannon replied on the same blog. "I found it touching that Mr. Jones chose such an isolated life, towards the end, and I probably could have been better at describing that it seemed by-choice, out of passion for his art, not out of depression or some sense of shame," he wrote. "This was not intended to define Mr. Jones and his legacy by the condition of his room, but rather to attempt to glimpse him as a human, to add to the official and public image we already have of him. If he lived in a mansion, I would have been just as eager to visit and write about that."